If you’ve ever tried to comb through a child’s long hair after a shampoo, you know it is tangled, sometimes into seeming knots, in various places. Conditioner and de-tangler is the only way to comb it without pulling the little one’s hair. 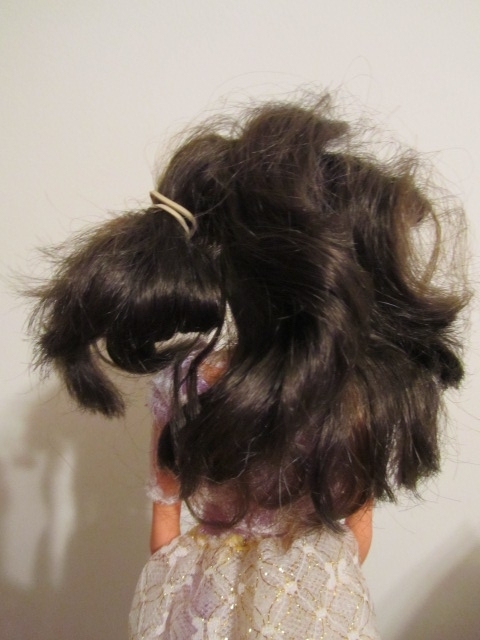 Tangles also come when they have decided to “re-do” their own pony tail or braids during the day. Yikes! Those knotted masses can bring tears and gnashing of teeth. We have to have them sit in front of us and then we can see the knots of hair and go ahead and work to untangle them. Even my own hair gets matted into a nest when I have put it up and then sit in a recliner for a while. Ouch! When that happens, I have to carefully reach back and edge out strands of hair until I feel the lump begin to loosen. Then I continue to budge more and more hair loose as I feel around without being able to see it. Sooooo right, isn’t it? When we try to untangle whatever has caused the knots in our gut, or emotions or head, we find we cannot do it. Our mind quite often is so messed up with what to do, how to do it, when and where, we simply can’t see a way clear. Jesus told us to be like little children. We only need to sit in front of Him and let his Spirit rid us of the tangles of deception that have stopped us from having a clear view of Him. God provides the way our feet should go on His path, and He gives us His strength to walk that distance with Him. He will hold our hands and guide our minds. His infinite knowledge has seen the future, and He knows the way we should go–whether we can see it or not. In fact He promises to make the path straight and smooth. I pray that you will try to focus your mind on God and the fact that He has all things under His power and gives the Spirit the knowledge of how to help you in every situation you might find yourself. Let Him untangle your life!